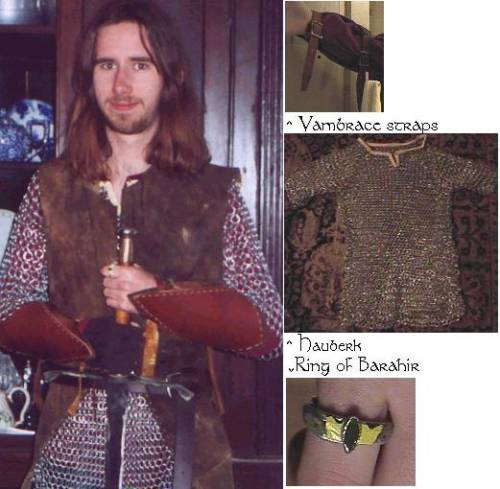 "...Oromë would sound the Valaróma his great horn upon the plains of Arda: whereat the mountains echoed, and the shadows of evil fled..."
The jerkin was made in about 2-3 months, though I was not working on it every night as in the case of the hauberk. I modified a deerskin vest my dad made back in the 60’s, took 2 panels out of the back, and added the tails to the bottom. The stitching was dry-rotting and the leather was rough so I had to wash and re-break the wet leather, and then restitch it together with artificial sinew. The 3 leather ties on the front came from a woven belt, which I cannibalized for straps. I stained it brown using walnut furniture stain. I sewed the red shirt in a weekend, using a Simplicity pattern (so sorry I can’t remember the pattern number), using some cheap red fabric for the arms, and (accidentally!) a darker red for the body. This was because the amount of fabric I bought was for the shirt one size down from the one I wanted. Luckily I had some extra red fabric left over from another costume. It doesn’t match, but you don’t see the body much so I don’t worry. For pants I just went to Goodwill and bought some black pleather pants for cheap. Attention to details makes or breaks a costume! The belt was bought at the dollar store, nothing fancy. Try to buy the longest belt possible, so that more will hang below the knot and look cooler. If I remember, Aragorn’s came down almost to his knees. For boots I just pulled on a pair of brown Wellington-style riding boots. The sword was made very quick, probably 2 weeks. If you don’t know about blacksmithing, you may be better off buying a replica or hiring a smith to make one for you. This one was made very fast using a car spring and flattening it with a trip-hammer. The cross-guard is wrought iron, the hilt came from part of a chair leg, and the pommel is brazed brass and a small doorknob. Cut the fingers off a black glove and you’re done! Since taking this picture, I have also made a sheath for the sword by making a wooden sleeve and wet-stitching leather around the outside. The quote describing Barahir’s ring is, I believe, from the Silmarillion. Wow! Well done with the effort to make everything! Looks Good!